What are the best hotels in Cancun? Where to eat in Cancun? Due to its wide white sand beaches, tropical climate and sprawling all inclusive hotels, Cancun is a globally recognized tourism destination, but few people know exactly where Cancun is located (including many travelers who have already visited). So, where is Cancun? Cancun is located on the northeastern coast of the Yucatan Peninsula, in the young state of Quintana Roo (founded in 1974). Imagine the country of Mexico in the shape of a human being. The Baja Peninsula would be an arm, the head would be Chihuahua in the northern part of the country, and the Yucatan Peninsula would be a giant foot. Cancun would be found on the bottom of this foot, right under the big toe. Cancun's location is privileged to say the least. 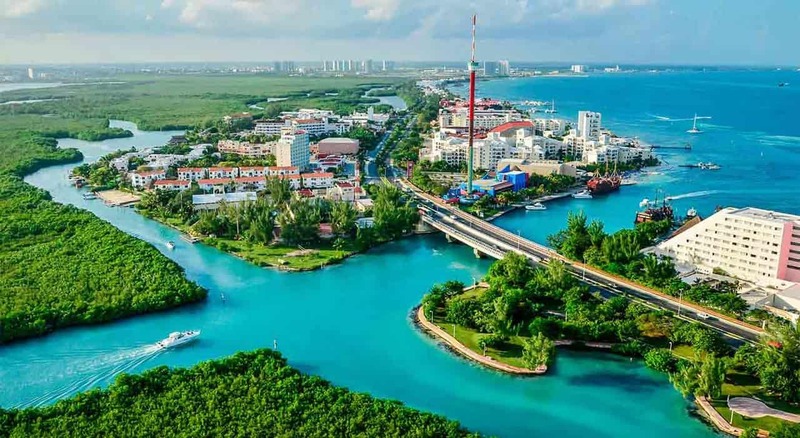 Quintana Roo's territory is home to places like Isla Mujeres (Island of Women, 30 minutes by boat), Playa del Carmen (one hour driving), Cozumel (one hour from Playa del Carmen by boat) and Tulum (two hours driving). In addition, the neighboring state of Yucatan offers Mayan ruin sites like Chichen Itza, Coba and Ek Balam, which are just a few hours from Quintana Roo. There are many tours in Cancun that can transport you to these ancient Mayan cities. Cancun is located 1,600 kilometers from Mexico City, 2,500 kilometers from Monterrey and 2,150 kilometers from Guadalajara. There are many low cost flights to Cancun available from these Mexican cities, and from the U.S. and Canada.